Our organic vanilla almond butter has been described as ""heavenly indulgence""! Why? Because it is our organic almond butter with an organic vanilla powder that comes together perfectly! Organic vanilla powder is a blend of organic vanilla beans and organic sucrose. Our organic almonds come fresh directly from California farms and are of the highest quality you can find in the world. We support all organic farming and its continued sustainability. Made with flax and hemp for their superb benefits! 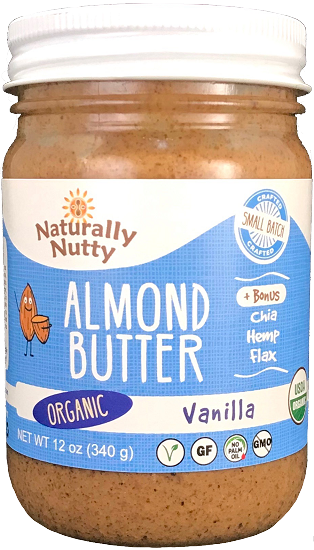 Vegan, Gluten Free, Soy Free, Dairy Free" Almond butter can be kept in the refrigerator or in the cupboard. 6 months in the cupboard, 8-10 months in the fridge. 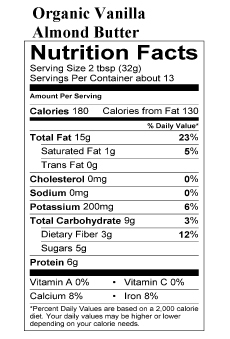 5lb tubs also follow this timeline.